Calorimetry on, originally uploaded by Craftydiddl. Yep-i joined the crowd and made one. Started it last night on a whim and finished it today. 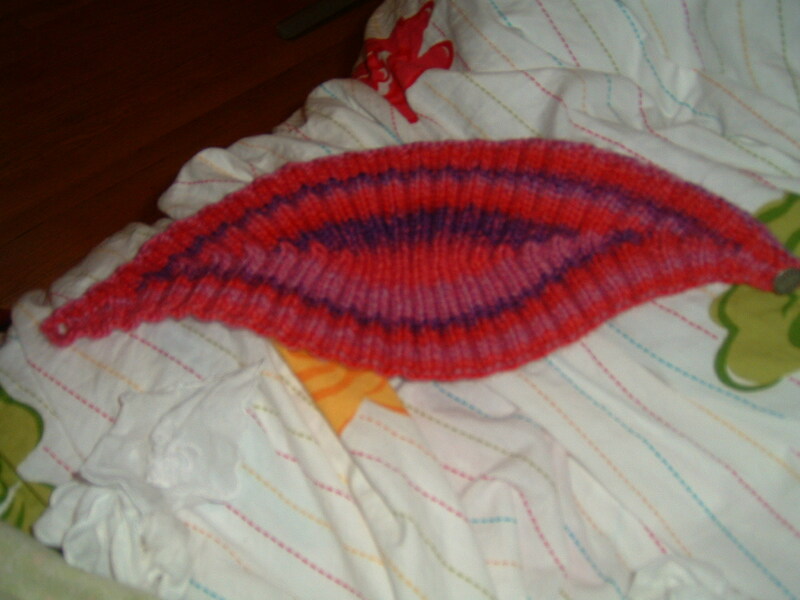 You can totally knit this in an evening and a quick knit like that makes me very happy. Mods-i have heard that this runs large as written so i cast on 100 sts instead of 120-but i still worked the repeats as written. Sorry about the crappy pics but they are the only two i could manage to squeeze out. See the slight annoyance on my face-not so nice, i tried to retake with a smile but i am sure you know what happened 🙂 Bzzzpppp!! And you were all so sweet to wish me the best for Little Man and hope i wouldn’t get sick. Inevitably i have the runny nose tonight while Little Man is feeling much better. His cold did not seem that bad though and passed really quickly so i am hoping for the same. Hey it is hard not to resist the crowd! Looks good! That would have been perfect for me today with it being so windy here! 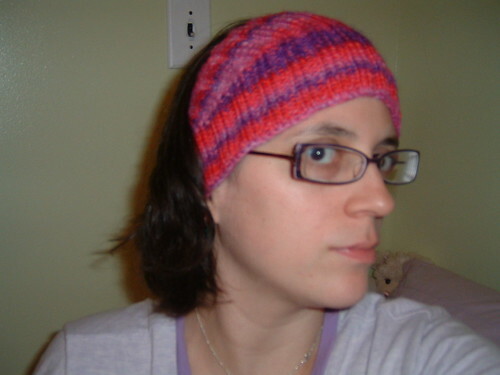 I really must try this pattern, I’ve seen many beautiful versions, including yours – red and violet, yikes! *^v^* I could really use some head protection in the Autumn, before it’s time to dig out the Winter hat. Very cute Calorimetry and it looks great on! I knit one but didn’t love it on me. It is a fun pattern and I can see why it’s so popular.